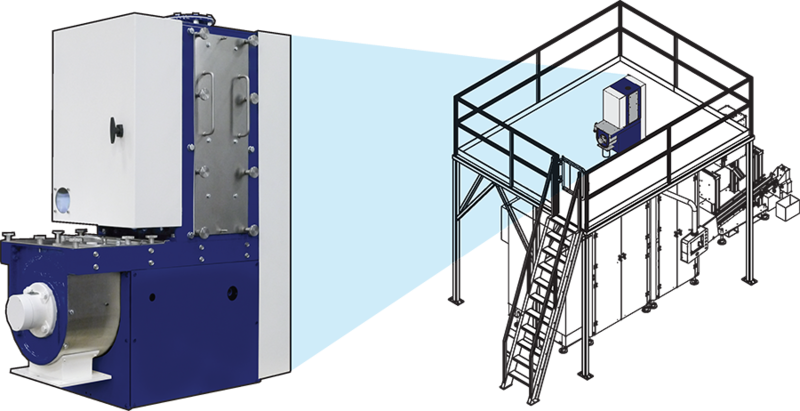 Visualization of the In Situ on top of a mezzanine directly above a capsule filler. CHICAGO, IL — MPE’s revolutionary, ultra-compact, “In Situ” 600.IS roller style coffee grinder is designed to operate “in place,” on top of capsule, pod and any other types of packaging machines. Until now, only large industrial roller mills could reach particle size distributions and coffee densities to meet the highest quality capsule experience consumers demand. This means more coffee batching, more grinder cleaning, more conveying, storage and possibly more totes. If a capsule or pod manufacturer wanted a grinder installed above their packaging machine, they were forced to be satisfied with a convenient, but inferior, disc style grinder. Now, the same leading edge roller grinding technology and patented densifier systems available with MPE’s larger grinders are available, along with a water-cooled environment, with the “In Situ,” which can be mounted directly on top of the packaging machine. No more hassles, just fresh ground coffee delivered direct to the filler, perfectly densified to your espresso or lungo style capsule or K-cup pod. Like other MPE roller mills, the In-Situ is a fully automated two-stage capsule grinder with programmable, repeatable grind and density adjustments. Coffee capsule densities meeting all other pod and K-Cup specs are easily attainable. Contact Sales Director Scott Will at scott@mpechicago.com for pricing. See us at the MPE booth, number 571, at the SCA 2019 Expo, April 11th through 14th where a full production In-Situ will be featured.